The Glasgow School of Art, which is considered Charles Rennie Mackintosh’s masterpiece, was completed in 1909. The building was badly damaged in a fire in May 2014 when the east wing was left relatively intact but major parts of the library and west wing were destroyed. The latest fire, which began on Friday night (15 June) was much worse, with aerial shots showing both wings of the building affected. The blaze came as a major £35m restoration, led by the architects Page Park, was nearing completion. The first phase saw external stonework repaired and the roof replaced before the east wing interiors were restored last year; the library, which housed original fittings by Rennie Mackintosh, was meticulously recreated. The vast conservation project was due to be completed by February 2019. 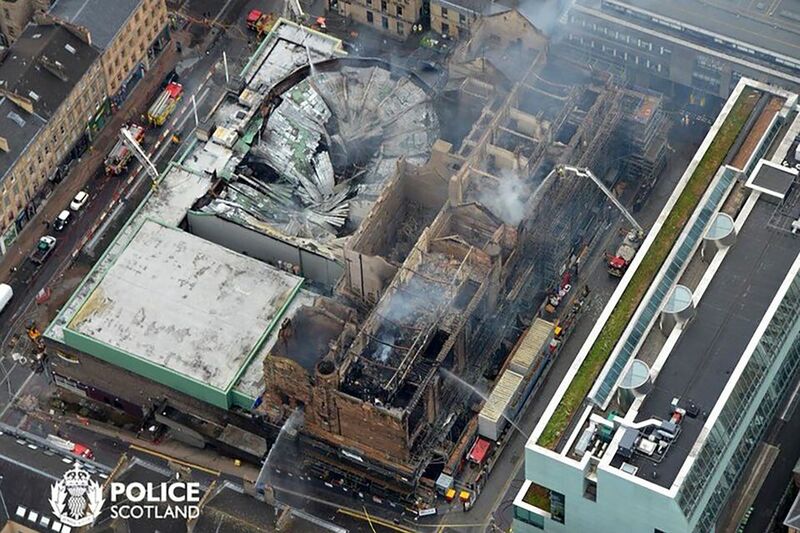 He adds that every “nook and cranny was digitised” by the Glasgow School of Art after the 2014 fire, which might aid future conservation efforts. Billy Hare, a professor in construction management at the Glasgow Caledonian University, tells The Art Newspaper that it remains to be seen if it will be possible to retain a facade from the current building. Rebuilding the art school would cost at least £100m, he says.